Liebrary: The only way to save our children from paying the national debt is to cut services? The former chancellor, George Osborne, has finally admitted that the Bank of England's quantitative easing (effectively printing money) made the rich richer. He was silent about that fact when he was chancellor. On top of that, interest rate cuts hurt savers. So, speaking from Washington in an interview with Bloomberg TV, Mr Osborne said: “We need to offset the very necessary loose monetary policy and the distributional consequences that it is having. Essentially it makes the rich richer and makes life difficult for ordinary savers.” He added: “There’s a role for government policy not in stopping that monetary policy which keeps the economy strong but in mitigating its impact. I think all of us who believe in free markets need to work harder to find an answer to the anger that people clearly feel out there.” What he couldn’t bear to say was that the only way to do that is to increase welfare and benefits, which he cut. The Bank of England’s Quantitative Easing (QE) programme (which means printing money to buy UK government bonds) props up the nation’s asset prices. For it to help the real economy, it needs to – you’ve guessed it – trickle down. That’s because most financial assets are owned by the top 10%. Half of us have no financial assets at all. How much QE has there been? 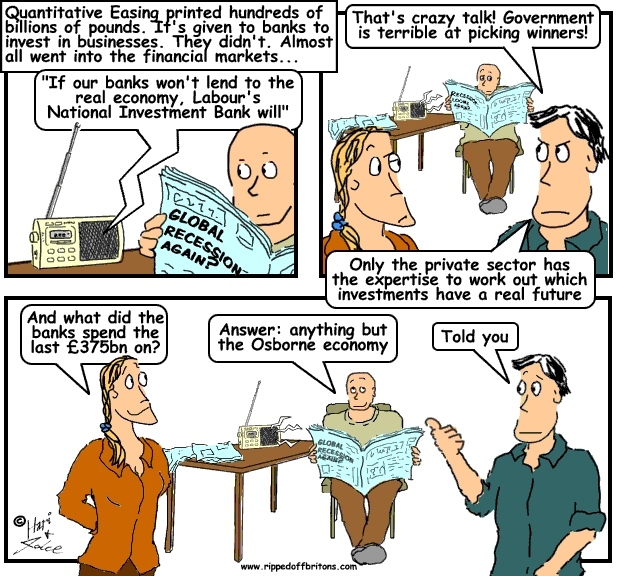 The UK created £375bn ($550bn) of new money in its earlier QE programme between 2009 and 2012. August 2016 brought a fresh injection of £60bn of QE. Did it trickle down? The banks are supposed to invest this new money in businesses. They didn’t. Almost all of it went straight into the financial markets and stayed there. The Bank of England admitted that the wealth enhancing benefits of its Quantitative Easing (QE) money printing exercise had gone to the wealthiest – giving them an estimated £600 billion boost to their wealth. Assorted Tory politicians jumped over poor bedraggled Nick Clegg for suggesting a wealth tax. To put this in perspective, HM Treasury figures show the UK National Debt passed £1,000 billion in the same year, 2012. Just the £600 billion increase to the wealthy resulting directly from QE would have paid off well over half of the national debt. However the government prefers to pump QE money into inflating the wealth of the wealthy by £600billion, and pay off the debt by cutting jobs, salaries, services, and pensions for everyone else. The amiable Tory MP Bernard Jenkin dismissed the notion of a wealth tax as the "politics of envy", advising not to 'strangle the goose that lays the golden egg'. Jenkin overlooks that while this particular goose ate all the corn, it hasn't produced anything from its nether regions that brought benefit to 90% of ripped-off Britons whose incomes have stagnated for decades. This article is ridiculous!the chart that has one solitary bar, valued at 600 bn for the wealthy isn't worthy of a school project. As Quantitave Easing was not in place in the years 2000 - 2010 there would be no value for it - therefore the graph makes perfect sense. c) The Bank of England's statement on the boost to the wealthy directly due to the Quantitative Easing programme. Thus showing that the boost to the wealthy by QE is worth more than half the 2011 national debt. As I said on Twitter the national debt is something over £7 trillion. Private debt is ~490% of GDP (according to Peston); or a bit over 100% of the net worth of the UK. Government debt is tiny by comparison and easily managed in a sovereign nation that can effectively borrow at 0%. The focus on government debt is a problem because it obscures the real danger that faces our economy. Which is that our private sector, particular our finance sector, is massively over indebted. It will be many years before enough of that debt is paid off (or enough zombie companies finally go broke) that demand will be able to pick up again. It took Japan 15 years in 1990, but we're way more indebted than they were. And let's not forget that we face many international threats to our prosperity. So let's call it a generation of zero net growth. QE is a drop in the bucket. But if we're putting drops in buckets the way to make them effective is to use them to give money to people not banks. If we make the single proviso that they must pay off debt before spending, then demand will increase again because everyone will have more disposable income. I'm in favour of a large amount like $5000 per adult. Which would be £250 billion in total or another 2% of GDP (@ £1.5 trillion). Smaller amounts might also work, but in for a penny, eh? Of course no one has the imagination or grit to do such a thing. They'd rather give the money to the banks, who use it to gamble on commodity prices, and refinance their own massive debts. I'd as soon give money to a heroin addict. Just for the record the finance sector alone accounts for debts totally 250% of GDP. What a wonderful contribution they're making to our well being. The banks need to be broken and smashed, and the rubble set to good use, under the Bank of Dave model. IMHO. Well said jayarava,the economy is stagnated because no ones got any disposable income. And giving money to the banks/markets is futile that money will stay as whole & lent or given as a percentage dividend 95% will stay with the bank/market. Give it to the people they will spend a higher % stimulating growth & prosperty. The graphs above show that the biggest increase in the gap between rich and poor happened under labour and the coalition have stabalised it. Unemployment is falling, the number of jobs is increasing and the gap between rich and poor is not widening. Your graphs above show that the coalition have been more progressive than labour and it is labour who where the profligate party of bankers excess. Over a million working class private sector jobs were lost from 2008-2010. Labour did nothing for the poor and working class, except increase their number and their dependence on the state. Labour abandoned the poor and the working classes and sucked up to the bankers and financial elite. I shall never forgive them for their treachery. You really don't get it you Moron the Government is not in charge, it matters not who makes your laws so long as I have control of your money and since 1986 and the Big Bang bankers have been in charge! Jobs increasing. 0 hrs maybe. Not real worthwhile well paid jobs!